Do you detect a running theme with today's posts? Usually I do this subconsciously and only realize it later, but today it was totally on purpose, I think. I present to you another beverage themed toy that is tiny, cute, and brightly colored. 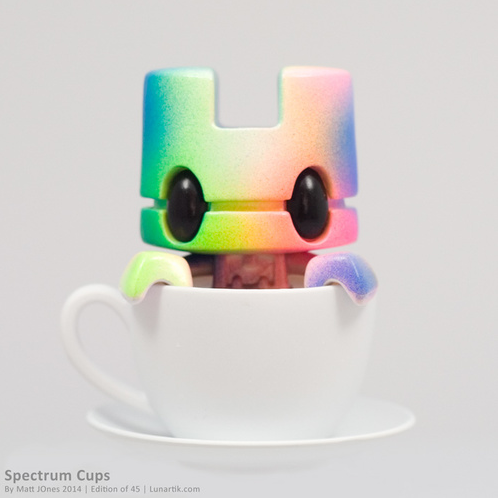 This time it's a Spectrum Cup of Tea from Lunartik! These little dudes are all hand painted and are going on sale at 4pm GMT today, which is coming up real fast. So if you want to own one of the 45 that are available you should stop reading this nonsense and camp out at this link. It even has a handy countdown clock to let you know when it goes on sale.